Lake City resident Steven Prather was recently recognized by We Honor Heroes volunteers from Haven. Prather is a United States (U.S.) Navy veteran who served in aviation for four years during Vietnam. Born in Georgia and raised in California, Prather was an automotive mechanic before and after his time in the military. 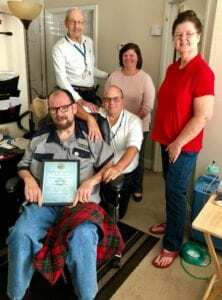 Navy Veteran Steven Prather poses with his certificate alongside Haven Volunteers (left to right) Don Quilio, Michael Bechard and Kate Cordero, and his sister Vicki Prather Davis. Prather worked on F-14 planes and compared his time in the military to scenes in the movie “Top Gun.” He said he enjoyed his time serving his country in the Navy. Haven is celebrating 40 years of providing local hospice care and is proud to honor its veterans with a pinning ceremony, which includes a veteran pin, a thank you card signed by the staff and a certificate of appreciation from Haven. These tokens of gratitude are presented by volunteer veterans, who end the presentation with a salute to honor the veteran’s service. If you are interested in becoming a Haven volunteer, please visit beyourhaven.org/Volunteer.